Labels India wishes you all a very Happy New Year 2018. 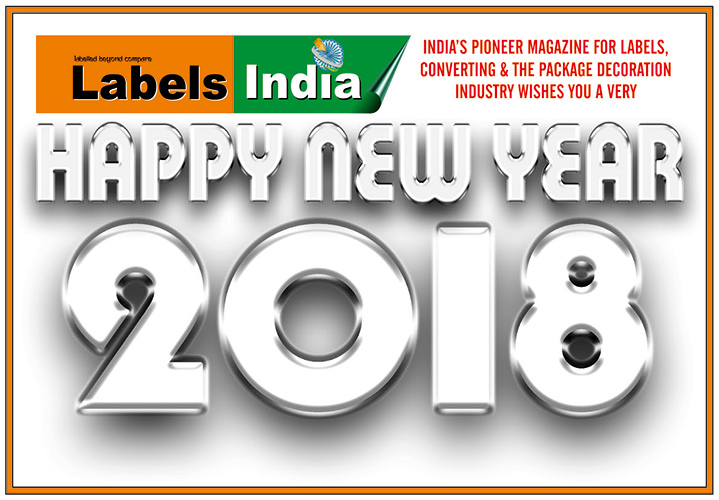 Labels India wishes all its readers, advertisers and subscribers a prosperous, healthy and Happy New Year 2018. As we move onto the New Year, we would like to inform you that we at Labels India will be revamping our magazine to add more news, interviews, spotlight features, event updates and what’s happening where globally. Do keep visiting www.labelsind.com for the latest trends, technologies and features, events and more on the industry. And we look forward to your continued support for the same. Do send us your news, views, product installations, machineries, awards and anything that you would like to read in our magazine. 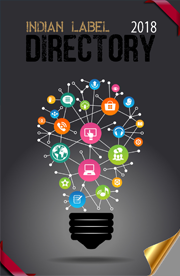 At the same time, Labels India will be coming out with our latest annual label directory - The Indian Label Directory – A resource for label industry at the Labelexpo Southeast Asia, taking place May 10-12 in Bangkok. Before that, you can find us at PT Pack show (March 1-4, Bangkok), Sino Label 2018 (March 10-12, Guangzhou), Asian Packaging Conference (May 2-3, Bangkok). 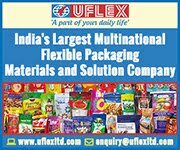 At the same time, Labels India will be Labeltech 2018 (June 8-10, Chennai), Labelexpo Americas (September 25-27, Chicago) and ofcourse at Labelexpo India (November 22-25, Delhi NCR). 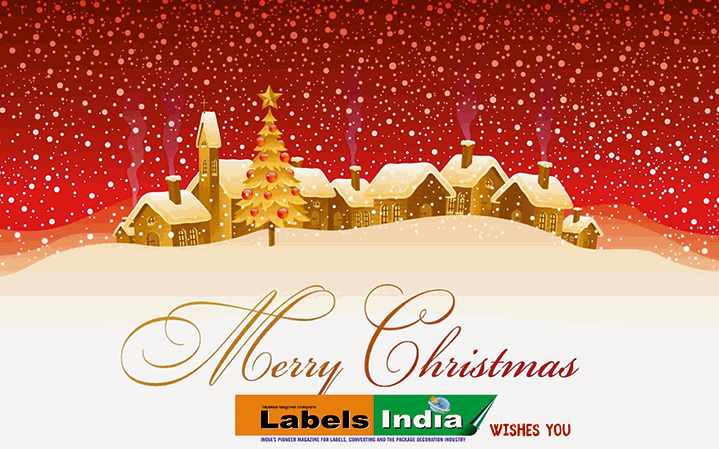 We at Labels India once again take the opportunity to wish you all a prosperous, healthy and Happy New Year 2018. Companies in the packaging branch and the related processing sector with ranges for the food, beverage, confectionery, bakery, pharmaceutical, cosmetics, non-food and industrial goods sectors as well as those offering sector-related services can now register online for interpack 2020. Internationally the most important event in the packaging sector and the related process industry, interpack will be held at the Düsseldorf Exhibition Centre from 7 to 13 May 2020. Both exhibitors and visitors can look forward not only to an entirely new Hall 1 and a new Entrance Süd but they can also benefit from an overall clearer hall structure with even more sharply focused segments. This means even shorter distances thereby making for more efficient trade fair visits. interpack’s unique selling point is its distinctive solutions package and coverage of entire value chains. This includes processes and machinery for the packaging and processing of packaged goods plus packaging media and materials and the manufacturing of packaging aids as well as services for the packaging business. The last edition of interpack in May of this year attracted 2,866 exhibitors and 170,899 visitors from 168 countries and thanks to busy orders from three-quarters of the decision-makers among them made for significant impulses in the sector. Registration for the supplier trade fair, “components for processing and packaging”, is also now open. The trade fair is being organised for 2020 in line with the tried and tested concept – in parallel with interpack at a central location at the exhibition centre. In terms of exhibitors it is aimed at companies that offer drive, control and sensor technology, products for industrial image processing, handling technology, industrial software and communication as well as complete automation systems for the packaging industry. Furthermore, manufacturers or suppliers of machine parts, components, accessories and peripheral devices as well as components and auxiliaries for packaging media can take part. Companies can register online at www.interpack.com/registration or www.packaging-components.com/registration. Existing exhibitors at interpack 2017 can use pre-completed forms. 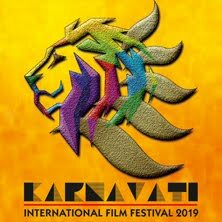 The official registration deadline is 28 February 2019. There are numerous other trade fairs in the interpack alliance taking place between now and interpack 2020. For instance, once a year in January the upakovka trade fair in Moscow or the Indian events pacprocess India/indiapack/food pex India and pacprocess Tehran in autumn – next time in November 2019 – and the Shanghai World of Packaging (swop). UPM Raflatac is expanding its RafCycle recycling solution to China. RafCycle services were launched in Changshu on December 6, 2017 during a customer event. RafCycle is also being promoted at Labelexpo Asia in Shanghai on December 5-8. The first RafCycle partner certificate in China was awarded to Hangzhou Changli, which is a label converter established in 2010. Hangzhou Changli is also the 100th RafCycle partner globally.The number of RafCycle partners has grown increasingly over the years as sustainability has become one of the key drivers in the labeling industry. Today more than 10 000 tons of label liner waste is being recycled in Europe through the RafCycle program. UPM Raflatac is actively searching for new RafCycle partners and the expansion to China is an important step in this process. The paper liner waste generated by the RafCycle partners in China will be delivered to Hangzhou Fulun Ecology Technology Co., Ltd. where the paper liner waste can be recycled back into pulp and paper. RafCycle is an innovative recycling concept that offers a new life for label liner waste which provides numerous benefits to printers, packers, brand-owners, and, of course, the environment. Turning waste into a resource is a key concept in the circular economy and an important part of our approach to sustainability. "The recycling of wood fibres in paper products is a closed-loop solution and a shining example of sustainability at its best", says Sharon Xiao, Sustainability Manager, APAC, UPM Raflatac. "We see sustainability as a key for success and a driver of innovation." UPM Raflatac is labeling a smarter future by developing innovative and sustainable labeling solutions complemented with world-class service. As one of the world's leading producers of self-adhesive label materials, we supply high-quality paper and film label stock for consumer product and industrial labeling through a global network of factories, distribution terminals and sales offices. After 15 years at the helm of the Gallus Group, Klaus Bachstein has made the decision to leave the company for pastures new. Mr. Bachstein joined Gallus Ferd. Rueesch AG as Director of Marketing, Business Development and Screen Printing Business on 1 October 1995, subsequently also taking over responsibility for Service and Sales. In June 2002, he took over the position of CEO of the Gallus Group. The Gallus Group was taken over by Heidelberger Druckmaschinen AG in mid-2014. Important business units and functions with synergy potential to increase customer benefit in the Heidelberg Group have been integrated since then, while still maintaining the Gallus brand. This includes market development by Heidelberg’s sales and service organizations, the development and production of joint technology platforms such as the inkjet unit and the software of the Gallus Labelfire’s digital printing unit, and the use of Heidelberg service platforms to improve Gallus’ services. The continued corporate development of Gallus as part of the Heidelberg Group will be headed up by Christof Naier from January 2018 onwards. 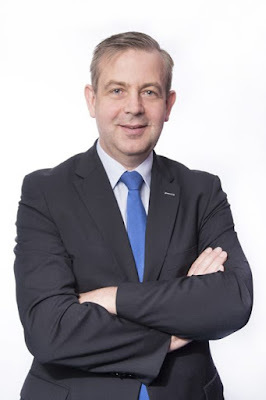 Christof Naier joined Gallus in July 2012, first as Head of Sales, Marketing, and Service Label Business, and since July 2017 as General Manager Label Business. 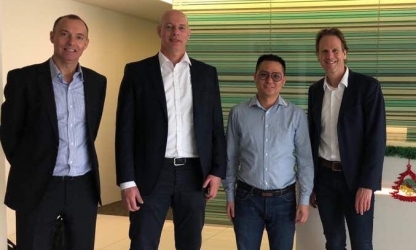 He will continue to rigorously implement the growth strategy for Gallus initiated three years ago and work at full throttle to drive the expansion of the digital business. The administrative board of Gallus Holding AG thanks Klaus Bachstein for his contributions to the development of the company and wishes him every success in his future endeavors. Screen Americas amplifies its proven ability to enhance the customer experience with the hire of long-time packaging professional, Charlie Brown, as Labels and Packaging Solutions Manager. Brown brings his 30 years of expertise in the printing industry to Screen to help converters realize the full potential of label inkjet. “Screen commands far superior imaging technology and consistency in the marketplace versus any of our competitors. I’m here to champion our team in assisting customers to integrate Screen technology and improve their business,” Brown said. His industry experience covers both the customer and production sides of printing, through a variety of positions in print and packaging procurement to executive management environments. Prior to joining Screen, Brown worked for a multi-facility printing organization where he developed and implemented an enterprise plan for high production inkjet printing. Before that he was a trusted contractor for a major retail grocery chain where he was in charge of the in-plant printing operations. “For more than two-thirds of my career, I’ve been involved in one way or another with many aspects of packaging including print quality control, color management, and workflow optimization,” he said. “I have been engaged in three printing start-ups and managed a software development company in the computer graphics field.” These experiences afforded him the opportunity to provide extensive instruction and training of customers throughout his career. Screen’s opportunities in the labels and packaging market are growing, thanks to the success of the Truepress Jet L350UV inkjet label press and the additions of the L350UV+ and L350UV+LM machine versions. “Our equipment is opening up markets by adding features that allow printers to expand their portfolio of applications,” he said. “Also, digital printing meets the demands of short run label production which is very prevalent in the private label marketplace where you have significant evidence of market segmentation. Screen technology helps to support that and will help grow it in a number of ways,” he added. One of his missions in enhancing the Screen customer experience is the development of an instruction program that helps customers understand how to fully utilize the color capabilities that Screen equipment can deliver. “By helping customers better understand what the Truepress Jet L350UV can achieve through its industry-leading application of high-end color, on a broad range of substrates underscored by other unique label production capabilities, we can help them open up new markets and niches they may never have realized were attainable,” Brown said. “I look forward to helping our customers fully realize their capabilities with Screen as their partner,” he added. Hop Industries, manufacturer of the durable Hop-Syn synthetic paper, today announces that it has published a guide for retailers that highlights how substrates used for in-store signage can positively or negatively impact their sustainability initiatives. The guide compares durable substrates, and highlights recyclability and eco-friendly manufacturing processes that can contribute to retailers’ green initiatives. Examples of signage range from retail banners and block-out window posters to hang tags and promotional cards, which require durability and a lasting impact. “Choosing the right durable substrate for in-store signage is important for retailers that must meet quality and sustainability mandates, and our guide provides insight about exceeding both,” comments Jack Smith, Senior Vice President, Hop Industries. 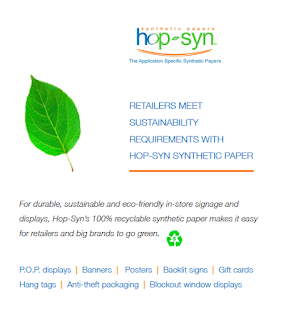 Retailers have an array of choices when it comes to durable substrates for in-store signage and materials, and the Hop‑Syn sustainability guide provides a helpful resource to distinguish the impact of alternate durable plastics. Hop-Syn synthetic papers are 100% recyclable and environmentally-friendly. Its unique construction eliminates pretreatment or top coating, as compared to other plastics. The durable substrate also holds up longer outdoor in comparison to polystyrene and unplasticized PVC. Hop-Syn is a division of Hop Industries Corp. based in Lyndhurst, NJ. Hop-Syn is a synthetic paper constructed from polypropylene (PP) resins and calcium carbonate (CaCO3), which provide extra durability and weather resistance over traditional pulp-based papers. Customers use Hop-Syn to print high quality graphics via offset litho, uv offset, flexo, screen, uv inkjet or thermal transfer equipment. Each Hop-Syn grade has unique characteristics to match the application, hence the phrase, “The Application Specific Synthetic Papers.” If customers need foldability for a map, there's a grade for that. If customers need thickness for a P-O-P sign, there's a grade for that. If customers need translucency for a light box, there's a grade for that. If customers need extra opacity for a block out window sign, there’s a grade for that. Label&Print, which returns to Birmingham’s NEC on 28th February & 1st March 2018, offers packaging industry professionals the opportunity to discover innovative finishes and techniques, learn about the latest trends and developments and find exciting new suppliers. The show, which is complimented by a programme of educational seminars, will also provide the perfect platform for visitors to get hands-on with a wide range of innovative new products. For example, printer brand, OKI, will be launching the OKI 4 and 5 colour label printers, as well as its first roll fed label printer live on the showfloor. The OKI 4 and 5 devices, which are quick and easy for short runs, require no set up costs and offer media handling flexibility, as well as ensuring less wastage. The OKI 4 and 5 will join its portfolio of printing products, including the industry’s first digital LED Five Colour A3 printer. Dantex Group will introduce its latest innovation, the PicoJet Digital UV Inkjet Press, at the show, where the company will also be celebrating its 50th anniversary. The PicoJet is a 7-colour printing system, which can be custom configured to offer wide colour gamut printing. Working at 350mm width and at 75m/min (250ft/min), the PicoJet incorporates 600dpi at 2.5pl dot size and is ideally placed for high quality and long run lengths. The new press will be running on stand, demonstrating its enhanced capabilities, which includes CMYK + white finish, chilled roller printing and a full variable data option. Nth Degree will showcase its new TruPack system, which is a complete solution for creating colour accurate samples, mock-ups and prototypes. TruPack allows customers to quickly and easily produce packaging including cans, pouches, shrink-wraps, bags and labels with spot accurate colour. AG/CAD will be showcasing the DYSS X5 digital cutter and sheet feeder, featuring the latest K-CUT Vision software. The machine has been designed specifically to handle all the prototyping, sample making and short/medium run production needs of corrugated, and solid board converters. The X5 comes in a variety of sizes with versatile tooling to suit all common packaging substrates. Folding boxboard, corrugated, display board and even structural honeycomb boards, textiles and paper can be processed, along with many other materials. Russel Richardson will be presenting its new reel splitter, which will allow them to process and securely destroy packaging even more efficiently. The new reel splitter will join the company’s heavy-duty primary shredder, which can process larger volumes of material such as wrappers, cores, palletised paper and other bulky waste. Designers and manufacturers of premium quality self-adhesive labels, The Label Makers, will showcase its latest range of label designs, including its award-winning creations for Mary Rose Gin, Lanique and Kakapo wine. Multi Packaging Solutions, part of WestRock Company, will use Label&Print to showcase its range of paper-based consumer packaging. The Multi Packaging Solutions stand will also display the extensive range of paper and board available from WestRock Board, including folding cartons, labels, tubes and cartonboards. De Jong Packaging will exhibit a wide range of products for the European and UK corrugated industry, including packaging solutions for the food, non-food, horticulture and e-commerce markets. Abbey Labels will exhibit a range of self-adhesive labels, including specialist scratch-off, five-page peel labels and its newly enhanced food and drink labels. Distributer Handisc Labels will be joined by its partner, Afinia to display the Afinia DLP-2000. This product has joined Afinia’s extensive portfolio of printers, presses and finishers. 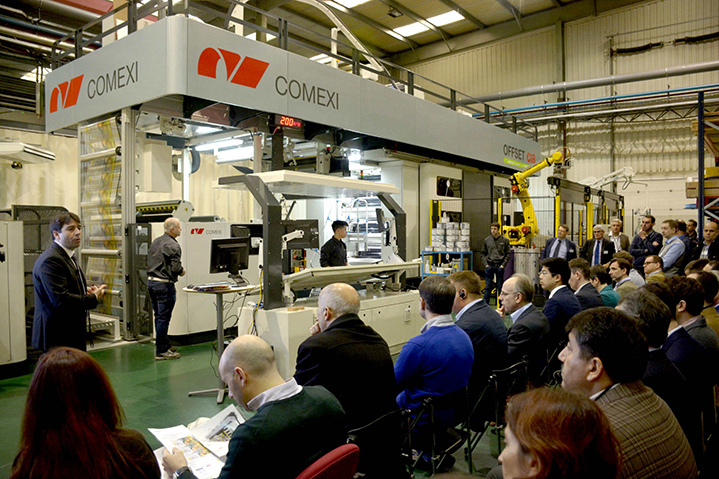 Comexi, specialist in solutions for the flexible packaging industry, has presented its latest innovations in its consolidated and revolutionary offset printing technology. The group celebrated an Open House in its headquarters in Riudellots de la Selva (Girona, Spain) where it showed the great evolutions followed by this technology in the last years. The Open House main goal was to show the stability, great profitability and high quality of printing that offers the Comexi’s innovative offset technology. Awarded with the EMAS in Europe, Comexi’s offset printing system is a world known and recognized solution for its commitment to the environment, its flexibility of production and its ability to adapt to the current demanding time to market. In the Open House, attendees had the opportunity to see first-hand the operation of offset printing at speeds close to 300m/min, noting that it is a technology that offers the highest levels of quality and colour adjustment. Comexi’s offset printing systems offers to a high competitiveness thanks to its good economic efficiency. 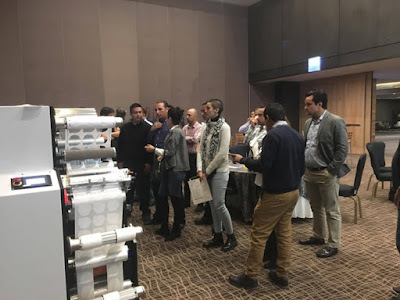 Attendees also closely followed the evolutions of the automation system that Comexi has incorporated into their press and verified how the robot, which is fully integrated, is able to automatically handle all the sleeves involved in the printing process. In this way, the works are more efficient and it reduces the downtime of the process, as well as improves the machine ergonomics. The Comexi CI8 offset provides maximum flexibility in the production process, allowing a very short time-to-market. In addition, Comexi CI8 offers considerable savings for companies due to the fast and keen in-house plate making. All operarting parameters can be stored and retrieved digitally. Inkwells regulation is done automatically. Offset technology is been characterized by using lithographic plates, with an approximate saving of 95% compared to photopolymers or engraved cylinder that have been used in traditional flexographic and rotogravure technologies. This reduction in the pre-impression allows to change more easily the design, the language and even to add promotional campaigns without additional printing costs. It also enables the reduction fo mininum runs and the reduction of printer material in stock. It prints in up to 8-colours, 7 offset and one flexo EB, with a web width of 900 or 1100 mm and with speed up to 300 metres / minute. A recent Digital One Roadshow provided a successful introduction to the product in Mexico. Realizing many label converters don’t have the luxury to step away from busy production schedules, Mark Andy set forth to bring comprehensive digital label technology directly to them. With the support of ACS, a partner of Mark Andy, the OEM hosted live demonstrations of Digital One in Mexico early December. Events were held in Guadalajara and Monterrey, proving to be an exciting and successful last leg of the 2017 roadshow series. Converters in Mexico are seeing increased demands for short run work and shorter lead times. End users adopting “Just-in-Time” (JIT) inventory strategies have forced today’s label providers to increase efficiency and decrease waste; digital hybrid technologies offer a logical path to agility within this dynamic and ever evolving market. As a result, many label converters are looking to add digital hybrid capability to their pressrooms. Digital One is an entry-level digital label press that utilizes CMYK dry-toner technology combined with a flexo print station for decoration and inline die-cutting. The press was designed for profitable short run prime labels and is based on a competitive pay-as-you-go structure with no click charges. ACS technicians were trained on how to setup and run the machine within a couple hours, reinforcing the operatory-friendly design and simplicity of the machine. Digital One garnered a large amount of interest from label converters in Mexico. Color Digital, Etiprint, and Matecmex Label, made the decision to purchase Digital One during the events, solidifying Digital One as an ideal solution for the Latin American label market. According to Vigna, “Digital One brings the everyday converter the first all-in-one digital hybrid solution. Smaller print shops can finally compete against comparable digital assets at less than a third of the initial capital investment; all without sacrificing print quality.” The compact design, minimal site requirements and ease of use appeals to converters who look to compete in the expanding prime, durable and variable data labeling sectors. This tour has inspired multiple business owners to take the first step in their digital journey – expanding their reach through hybrid printing technology. The events give Mark Andy the unique opportunity to talk one-on-one with converters and showcase new technology that will give their businesses a competitive edge. Mark Andy looks forward to expanding reach of the Digital One roadshows in the upcoming year. Effective retroactively as of January 1, 2017, BST ProControl is now fully integrated into the business processes of BST eltromat International and will continue to operate as an incorporated, independent business unit at its current location in Wenden. BST eltromat has thus taken the final step in merging the two companies and has further optimized its organization and processes. The name ‘BST ProControl’ will be kept for the business unit. For customers, the company is aiming for continuity. They will profit from numerous benefits through the integration. In 2013, BST eltromat founded BST ProControl GmbH as a 100% subsidiary through the acquisition of the companies Betacontrol and Protagon. BST eltromat has thus expanded its portfolio with measurement and quality assurance solutions for flat materials and has gained extensive practical know-how in these matters. Now, customers can use BST eltromat’s solutions in the sense of Industry 4.0 to gain even more complete quality information from web-processing production processes. In the plastics industry, for example, networked systems along the value chain – from layer thickness measurement in the film production through, e.g., the processing of films in print to the supply of roll-shaped packaging materials – creates specific added value for customers: Each of these steps yields data that is needed for completing the relevant tasks. Until now, this data was used as standalone information. It did not flow from one process step to the next. These communication barriers are now overcome through more extensive integration of the systems. Data gained in one process step can now flow into subsequent processes and thus optimize them. This was another reason for merging the two companies. They now have a unique worldwide service in terms of quality assurance in web-oriented production processes. By integrating its specialists in the group-wide activities of BST eltromat International, the BST ProControl team can benefit from many forms of collaboration. It has also become more flexible. “For our customers, this merger means that they can now communicate even more efficiently and more purposefully with our company. Your contact persons at BST ProControl are now seamlessly integrated into our company-wide processes and can respond more quickly to your concerns. Headquarters is handling many of the administrative tasks, for example. This allows the BST ProControl team to fully focus on its core competences, meaning that customers can be supported more efficiently than ever,” Kristian Jünke, Managing Director for Sales and Service at BST eltromat International explains one of the important advantages. He will be heading the BST ProControl business unit. “It is important for us that our market presence is streamlined and easy to understand for customers. This was another reason for the seamless integration,” Jünke adds. Schawk, a part of the SGK Brand Solutions group of Matthews International Corporation, a leading global brand development, activation and deployment provider that drives brand performance, announced today that their ColorDrive print quality programs and tools will add support for new ISO standards 20654 (SCTV, Spot Color Tone Value) and 20616 (PQX, Print Quality Exchange) in 2018. Managing print quality in consumer packaging across SKUs, substrates, channels and countries helps brands realize the spirit of their packaging designs and drives both consistency and perception of product quality on shelf. To accomplish this, many brands are investing in print quality programs. ColorDrive is a business built around print quality, using an open platform that enables printers and brands to share data. Using these new standards, ColorDrive will provide a path to the print quality future, helping printers and brands manage quality with greater precision and transparency. Spot colors are a key element of brand packaging. Today, spot colors are used for brand identity and are frequently integrated into the overall packaging graphics. As a result, not only is the solid color of a spot ink important, but the tone and how that ink overprints with other inks has become critically important. Now with ISO 20654, brands have a powerful way to set requirements for and track both solid ink color and tone value. SCTV’s new “color-based” method for measuring spot color tone makes calibrating spot colors easier and more consistent. With SCTV, brands and their print suppliers have more control over their quality, helping them fully realize design intent. The increasing popularity of print quality has motivated many brands to adopt programs. In today’s world, printers are often required to juggle a variety of tools in order to meet requirements for different brands. This “juggling act” creates an extra load on the printer and can compromise the efficiencies that a print quality program is intended to bring. In response to this challenge, the industry has created ISO 20616. ISO 20616 PQX is a new method for exchanging data between web-based reporting tools, such as the ColorDrive web-based platform, and third-party quality control tools. With this new exchange format, brands will have a way to collect print quality data from any supplier around the globe. This exchange format will give printers the freedom to choose the production technology that best helps them meet the brand’s requirements and gives brands the ability to harmonize data from different suppliers using different solutions. 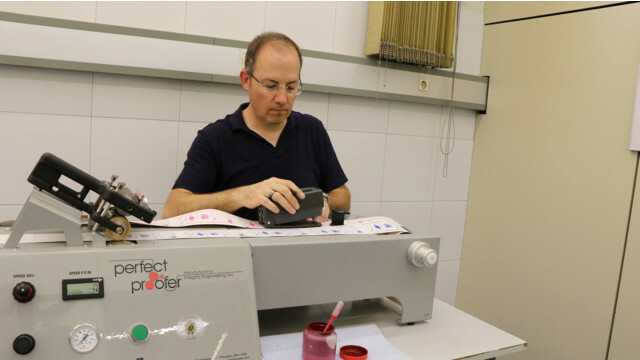 GSE has donated a table-top Perfect Proofer to the Tajamar School of Printing, in Madrid, Spain, to enhance the understanding of flexography, and the importance of colour, print quality and efficient production. Also donated was GSE’s Ink management software. Tajamar offers a comprehensive educational programme with strong vocational and technology elements. The printing school continues to grow, driven by the demands of the labels and flexible packaging sectors, and has around 350 students, with an annual admission level of about 90 students. The Perfect Proofer, which replicates the exact conditions of the flexo press, is ideal for proofing inks and optimising print quality before putting jobs into production. Pressure, speed, plate type, doctor blades and anilox specifications can all be adjusted, and the results seen immediately. GSE Ink management software will enable Tajamar to use the latest software to train its students, giving them a hands-on understanding of the benefits of the technology and its contribution to colour quality assurance and waste elimination in the print workflow. Among the software’s many time-saving features are precise formula preparation and accurate batch tracking, while its reporting function gives users improved cost and stock management. “Asahi Photoproducts is all about the future of print – especially flexographic printing. Our goal is to radically improve the efficiency of flexo production and to support flexo printers. And we are doing that in so many ways,” says Dr. Dieter Niederstadt, Technical Marketing Manager, Asahi Photoproducts. “First, our unique Clean Transfer Technology using our own specially engineered polymer chemistry, enables flexo printers to deliver what brand owners want – faster, better– and still make a nice profit. The key here is the ability of our Clean Transfer Technology to drive press up-time. We’ve seen cases where up-time has improved from 25% to 50% and more. We see companies using our technology operating at 33% higher OEE – and that can mean a 33% increase in profitable turnover. In case of Gateway Packaging Company i.e. even more. They improved their OEE by 53%, he says. These are just two ways Asahi can help you grow a strong and profitable business far into the future. Companies that are moving slower are being gobbled up by larger companies. Larger companies dominate and smaller companies fill niches. It’s survival of the fittest and our entire company is focused on helping forward-thinking printing firms of all sizes not only survive but thrive,” concluded Dr. Dieter. Enterprises today are paying increasing attention to the needs of sustainability and environmental friendliness in order to stay competitive. Many of them have already started green production to maintain their leading status of the market and for better brand image. The China International Exhibition on Label Printing Technology 2018 (hereafter “Sino-Label 2018”) will be held on 10-12 March 2018 at Area A, China Import and Export Fair Complex, Guangzhou, PR China, showcasing different green and economic label solutions to help industry players maintain competitive edge. Sino-Label 2018 meets the environmental needs of the industry with a “Green Label Materials Hall” that covers green materials for anti-counterfeit labels, in-mold labels, logistics labels and electronic labels, and offers label printing enterprises a convenient one-stop platform for sourcing. 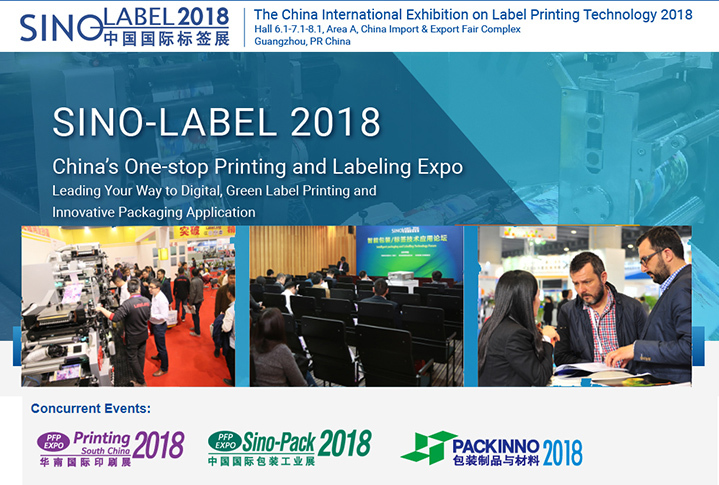 A large number of industry leaders will gather at Sino-Label 2018, confirmed exhibitors include YUPO/Xinshan, Ritrama, The Bond, Zhongshan Fuzhou, Antac, Toyo Ink, Hiway, Univacco, Decro, Soontomax, LECCO, Jinwanzheng, AKO, Gehade, Arjobex, Century Security, Dicheng, Wangli, Secutac, Zechin, Lafoison, Hengrunda, SEVENACE, ZOMAX, etc. (listed in no particular order), providing the latest label printing solutions for label industry players. Visitors will have access to many new equipment and technologies to explore green, highly-efficient and lower-cost applications at the 3-day event. Univacco is a Taiwan based company with over 20 years of expertise in foil and film products. Their "cold foil" is made for narrow-web press and sheet-fed offset press, can achieve silver, gold, transparent and holographic effects, and is over-printable with both conventional and UV inks. Their "hot stamping foil" features fine to board definition, over-printability with conventional and most of UV inks, high gloss and solid coverage, and wide application to various substrates such as plain paper and board, PP/PET/OPP laminated paper, UV printed / vanished substrate, etc. Univacco’s “decal printing foil” works perfectly under low-temperature transferring requirement. It has good definition and coverage, can also be applied extensively with base oil and gloss oil, and have no colorfastness and wrinkles through the oven-drying process (up to 180℃). Lecco is one of the influential adhesive makers in China. In Sino-Label 2018 they will showcase their BOPP Lamination Series (Solvent-Based Adhesive BOPP Series, Environmental Water-Based PSA BOPP Series, PET Lamination Series and BOPP Transfer Films) and label materials including those for mirrorkote label, art label, woodfree label, thermal label, thermal transfer label, aluminium foil label, polyester label, PVC label and synthetic label. They are applicable for the fields of daily chemicals, medicine, logistics, electronic & electronic appliances, tools, etc. The Bond Chemicals is a state-certified high-tech company in China. At Sino-Label 2018, they will present several innovative, high performing and eco-friendly products including Wash-off Label adhesives, Breathable HMPS adhesives, Cold-flow Rough-surface Label adhesives, Freezer-grade Low-temp Adhesives, etc. These labels feature high tack, high peel strength, easy-die-cutting, water wash-off and easy recycling. Ritrama mainly manufactures self-adhesive materials, including coated papers and thermal papers, various films self-adhesive and PVC for digital ink jet printing, etc. Their products cover the industries of household, body care, beverage, food, electronics, chemical and white appliances. AKO logistics labels use imported Ricoh face material, which is waterproof, oil-proof, alcohol-proof, and scratch-resisting with high image stability. The non-toxic eco-friendly water glue used has high viscosity, and the LED ink for printing features clear printing, minimal energy use and eco-friendliness. AKO's "AP1001 copper paper category supermarket label", "AP2001 copper paper category logistics label", "AH1001 Thermal paper category supermarket label", and "AH2001 Thermal paper category logistics label" feature clear printing, high tack adhesion, and properties that avoid label blurring and fall-offs. They are suitable for market retail and logistics use, providing customers with green and cost-effective solutions. Print-to-Pack One-Stop Trading Platform – Pre-register Now! Together with the concurrent 25th South China International Exhibition on Printing Industry (Printing South China 2018), the 25th China International Exhibition on Packaging Machinery & Materials (Sino-Pack 2018) and the China (Guangzhou) International Exhibition on Packaging Products (PackInno 2018), Sino-Label will create a 4-in-1 Expo that will be held across 10 halls with an exhibition area of over 100,000 sqm and the participation of 1,200 exhibitors, making the expo a perfect one-stop trading platform that covers printing, labeling, packaging and packaging products, where visitors can conveniently achieve every visiting purpose under one roof. Joining hands with Sino-Label 2018, Printing South China 2018 will work on a “Flexo Printing Zone”, where narrow-web and mid-web flexo printing equipment, materials and technologies will be displayed, and printing solutions with high efficiency, lower cost, and environmental-friendliness will be presented. Online pre-registration is now open at the official website www.SinoLabelExpo.com. Buyers are encouraged to pre-register online to enjoy privileges such as getting one free copy of show catalogue, having priority to participate in symposia and being free from on-site registration procedure. The eighth edition of Labelexpo Asia 2017 closed in Shanghai earlier this month with record visitor numbers. Held at the Shanghai New International Expo Centre (SNIEC), the region’s largest show for the label and package printing market attracted 20,084 buyers, up 19.9% on 2015. Expanding its feature content and show footprint, Labelexpo Asia 2017 featured 300 exhibiting companies, including 80 first time exhibitors. The event was used to launch many new flexo and digital presses with at least 54 working machines demonstrated live on the show floor. Unveiled as part of the special Digital Trail feature area, major digital press launches included HP Indigo’s WS6800, Xeikon’s 3500, Domino’s N610i digital color press and the Durst Tau 330E UV digital inkjet press shown by Fuji Xerox. Other significant machinery launches included the M5 Excellence inline UV flexo press from Bobst and Zhejiang Weigang Machinery’s ZJR-330/450 flexo printer and ZX-320/450 intermittent label offset press. Label Source exhibited the YTP-260R6C+1 full rotary letterpress printing machine, while Codimag and IST showed an LED-UV semi-rotary offset press for the first time. Brotech debuted its SDF 520 multi-functional finishing system for digitally printing labels and packaging while Luster Light launched new brand new proofing solutions at the show. Continuing the demand since the last show in 2015 for more sustainable products and services, UPM Raflatac promoted its RafCycle recycling system and Hangzhou Changli became its first Chinese partner. Avery Dennison displayed its updated products and new technology including cold chain logistics, removable labels, hose packing, as well as its solution for putting its sustainability concept into action and promoting green developments for the industry. In addition to the Digital Trail, the show also hosted its first SMART Zone which highlighted new technologies and applications for improving customer appeal and for tackling anti-counterfeiting. DPS Innovations, Shanghai Jion Point Information Technology, ST, Thinkgo Technology, Visualnet and Voyanic showcased a range of new active and intelligent label and packaging applications such RFID/NFC labels, nano materials and specialist inks. PAMEX is opening its doors today to a wonderful show with maximum participants getting maximum inquiries/orders for the products/services. Building on the incredible success of its last edition and three successful editions earlier at Delhi, Pamex is all set to raise the bar again and turn out to be a great platform for all the industry stakeholders to congregate and explore the growth opportunity in the print industry. To be held from 18 to 21 December at the Bombay Exhibition Centre, Goregaon, Mumbai; Pamex 2017 is expected to be a huge success recording good business, heavy footfall and worldwide recognition with exhibitors not only from India and neighbouring countries, but across the ASEAN. Having promoted Pamex at China Print 2017 in a major way this time, the AIFMP team have been successful in bringing in a larger delegation this time of the Chinese print and packaging manufacturers who have booked 1,000 sq/m space at Pamex, as against 278 sq/m in the previous edition. Same goes with Japan as Japan Printing Machinery Association (JPMA) is getting a larger congregate of not only the big giants but also the small and medium companies to participate at Pamex 2017 and explore the Indian market. Organized by All India Federation of Master Printers (AIFMP) in association with Print-Packaging.com, some of the leading Indian and international brands will be showcasing their latest technologies across various categories like prepress, in-press and post-press segments. The show will host dedicated pavilions for label and narrow web printing and presses; paper and board converting and corrugated machinery and equipment. Flexo and gravure printing, digital presses, web offset presses, sheet fed offset presses and signage machinery and process equipment will be displayed at the event. Print: Commercial printing, newspaper printing, large format printing, digital package printing, binding on demand, post press & prepress, UV/Latex inkjet technologies, flexo & gravure printing, screen printing, digital solutions, print supplies, etc. Narrow Web: Paper, film, adhesives, liners & varnishes, label printing, dies, cylinders & tools, inspection systems, accessories, etc. Package Converting: Paper, board, film & foils, folding & gluing, cylinders & rolls, coating & laminating, inks & coatings, slitting, sheeting & surface treating, die-cutting & embossing, etc. Corrugated Packaging: Corrugated box manufacturing machinery, heating systems & boilers, testing equipment for paper & packages, computer software developers for box design, kraft paper, starches & adhesives. “The upward trend, affordable technology and digital innovations have revolutionalized the print industry in recent years. 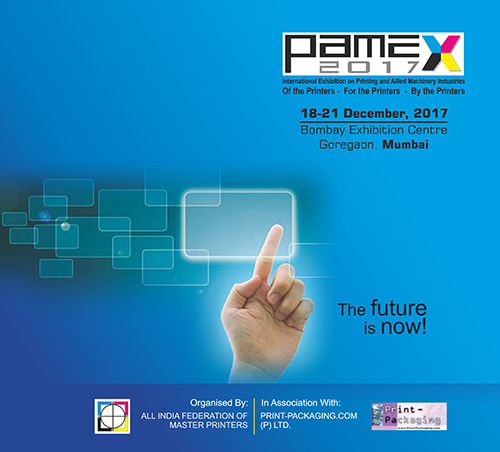 In such exciting times Pamex’17 will give that extra boost to the industry, benefiting the manufacturers of machines, printers and the end users.” said Tushar Dhote, Chairman of Pamex Organizing Committee. “Pamex has grown over the 2015 edition in terms of exhibitor space. 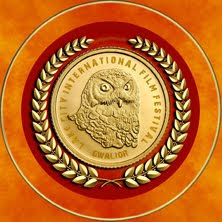 The prodigious success of previous edition is reason behind enormous bookings a year ahead the show. It should attract twice the visitors. We can see phenomenal enthusiasm among people from the industries that are eagerly looking forward to it. Not only the old participants but many new companies have signed up. Pamex has extensively promoted in neighboring countries like Bangladesh, Nepal, Sri Lanka, China and UAE to enhance the international characteristics of the event. Pamex’ 17 will have more launches and latest technology on display, offering more business opportunities.” said Neetu Arora, Director of Print-Packaging.com (P) Ltd.
One of the reputed Indian manufacturers of web offset presses for newspapers and books has now ventured into the labels segment and launched its first flexo label press, StarFlex. Claimed to have been tested successfully on aluminum foil, unsupported films, labelstock and other substrates, it has been tested to run at 120m/min with labelstock, the 6-color, servo-driven flexo press has a web width from 10in to 20in, depending on customer requirement. It can be equipped with UV lamps, cold and hot foiling units, delam, relam, turnbar, chill drums and other units. There is also a possibility of offering a combination press whereby the press can be integrated with rotary screen, offset and gravure units. While gravure and offset units are developed by NBG Printographic Machinery, the company is partnering with other companies for UV lamps and rotary screen. The UK’s leading packaging technology event, Empack, will return to Birmingham’s NEC on the 28thFebruary & 1st March 2018. The two-day event will offer a unique opportunity for decision makers frommajor brands, converters and retailers to discover the latest technological advances in logistics and transit packaging, packaging machinery, robotics and automation. The show will also offer visitors the opportunity to get hands-on with a range of new products, with many exhibitors choosing to launch their latest innovations live on the showfloor. Paper and cardboard packaging manufacturers, Graficas Salaet, will be launching two new products at the show. Its new Black Pizza Plate and its Step and Twist Tulip Cups. Also on show will be its extensive range of packaging for the food industry including baking cups, paper bags, trays, cake boxes and boards. Greenearth Food Packaging will present its brand-new range of oven-proof, biodegradable ready meal containers made from paper pulp. The range will be available with lids and in various sizes and colours to enhance the aesthetics of products. Automated Packaging Systems will launch its new AirPouch delivery system at the show. The new system will offer customers using AirPouch cushions in its packaging process the potential to supply multiple work stations with strings of AirPouch cushions from just a single machine. The system utilises the AirPouch Express 3 machine to inflate AirPouch material on site. OAL will showcase APRIL EYE, an intelligent date code verification system set to cut food waste in the supply chain. Developed in partnership with the University of Lincoln in a retailer led initiative, APRIL EYE uses artificial intelligence to read back and verify date codes, preventing product recalls related to the incorrect application of date codes. By removing human error from the supply chain, APRIL EYE reduces food waste related to the incorrect date coding of products. Manufacturers of self-adhesive labels and tags, Abbey Labels will exhibit its range of scratch-off, five page peel labels and its newly enhanced food and drink labels. Shalam Packaging with be exhibiting its range of buckets and tubs for the food and chemical industries. It will also be joined by its sister company, Stak Plast who will be showcasing its wide range of plastic packaging solutions.